The Indian Railways, the world’s 7th largest and India’s biggest employer, has been continuously trying to address various health related issues of its employees. 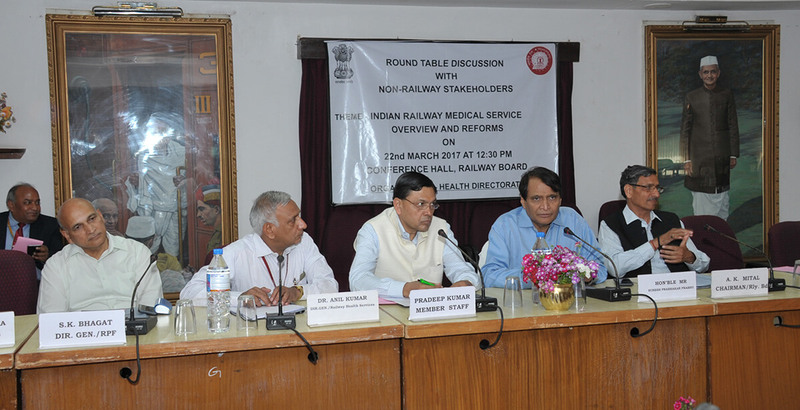 Keeping in mind the changing times and to make sure the requirements of health services keep pace, the Railways organized its first ever Round table conference on Indian Railway Medical Services reforms on Wednesday, 22 March 2017. H2 Life foundation, represented by its president Mr. Vikas Sharma and Secretary General Ms. Masha Mukherjee were among the select knowledge partners and domain experts invited to attend and present recommendations. The event was graced by the Hon’ble Minister of Railways Shri Suresh Prabhu, Director General Railway Health Services Dr. Anil Kumar, and Chairman, Railway Board Mr. A. K. Mittal besides senior officials from the ministry. Among the knowledge partners there were representatives from leading International NGOs like WHO and hospitals like MAX. H2 Life Foundation presented several recommendations for reforms and for modernizing the Indian Railway Medical Services which were very well appreciated.